Steamer - Mods & Workshop Workshop and technical talk for the 900 carb Tiger. Triumph Forum: Triumph Rat Motorcycle Forums > Tiger > Steamer - Mods & Workshop > how long does a chain slider last? how long does a chain slider last? I just installed a NEW OEM LOWER chain slider (rubber? really Triumph! and spent $30 USD) and rode 16 miles all under 50 mph. It appears that this slider is about 1/2 worn away already! So, I am now going to design and build one out of nylon block which should last longer than this one will. Any experience or input is welcome! Last edited by bowyer2002; 08-07-2018 at 02:42 PM. 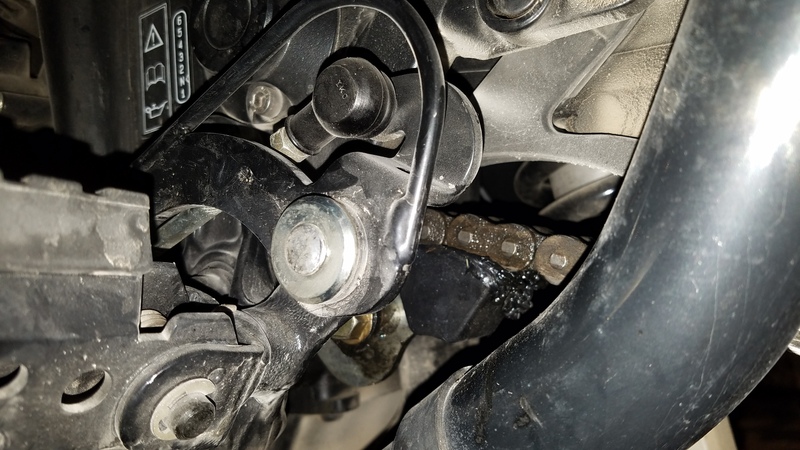 I do have a lowering kit on my Tiger but that shouldn't effect the LOWER chain guide as much as the UPPER one. I have nylon stock ordered to fabricate my own lower slider - details as I get this accomplished! Did you get one sorted? Main Motorcycle: '02 Bonneville 100yr anv. Rollers off motocross bikes work great for chain guide/rollers. I use to use skate board wheels also. @Tink , we are in full blown winter and without a heated shop I have not taken time to fabricate my custom 'nylon slider' and get it installed. When I do, I will post up directions, photos and my results of my efforts. i had two '95 steamers that had the axle cam in the low ride position and never had a problem. i now have a '97 trophy in the same position and have contact with the lower slider on decel.